The 27th century: Proxima Centauri, an undistinguished red dwarf star, is the nearest star to our sun - and (in this fiction), the nearest to host a world, Proxima IV, habitable by humans. But Proxima IV is unlike Earth in many ways. Huddling close to the warmth, orbiting in weeks, it keeps one face to its parent star at all times. The 'substellar point', with the star forever overhead, is a blasted desert, and the 'antistellar point' on the far side is under an ice cap in perpetual darkness. How would it be to live on such a world? To many anti-heroes, no lovable characters. Great world building, lots of thought put into it. Ultima by Stephen BaxterIn PROXIMA we discovered ancient alien artefacts on the planet of Per Ardua - hatches that allowed us to step across light years of space as if we were stepping into another room. Whoa... hang on a minute 'hatches?' stepping across space as if stepping into another room? That sounds similar to Peter F. Hamiltons' Compressed Space Tunnels (wormholes) of the Commonwealth series. That sounds like something I'm interested in. I checked Proxima again to see why I missed picking up that book to read. I read Proxima's book description again a little confused. They sounded like two different stories. It's amazing the power of the cover and book description in selling the book. It's amazing the power of the cover and book description in selling the book. Here was a gem almost lost because the first paragraph of the 'back cover' didn't grab me. 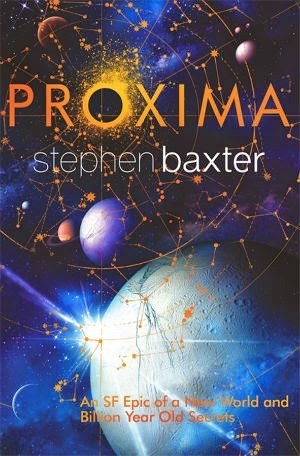 I started reading Proxima and to be honest if it wasn't for the foreknowledge that somewhere in this book a 'Hatch' would be found, I may have put it down without finishing it. It started out slow and kept going for most of the book. One of the main reason I found this a difficult read was that there were too many anti-heroes, in fact all the characters seemed to be anti-heroes, I do like my heroes. The major story arc of this book is the colonisation of 'Per Ardua', a life-bearing planet in the Alpha Centuri system. The way the United Nations did it was similar to the colonisation of Australia, round up a bunch of ne'er-do-well and ship them out to the new world. However in this case they had a population of about 1000 people, but they split them in groups of 14 and dumped them on the surface of a new, un-explored, un-surveyed planet with some supplies and left them to fend for themselves. They didn't even get Governors or guards, as there was nowhere to go or run to. Now, let the worst of human nature loose in those marooned groups and watch people revert back to playground politics. The goal of these new colonists was survive, multiple and fill the planet Per Ardua so that the Chinese couldn't lay claim to it. Most of the following chapters showed the worst of human nature, no one was interested in surviving, for the long term, it was all short term 'what's in it for me' type thinking. There was no interest in discovery, whether it be trying to learn about the new world around in order to survive, or to study the new life forms indigenous to the planet. This lack of interest in what is happening around them is prevalent among all the characters. I read books to escape from this type thing, I didn't want to spend my reading time dealing with jerks and anti-heroes. To be fair, there was one character who took a slight interest in the new world around him, that was the main protagonist Yuri Eden, (not Yuri Jones as in the book description above, he hooked up with a Mardina Jones toward the end of the book). There also seemed to be minor story arcs which didn't go anywhere, in most books the author introduces you to some story element or arc because it moves the main plot along or provides clues into something bigger. To me, the story arc involving the Angelia sentient space probe could have been minimised or even removed. To me be it didn't serve any purpose, and when that purpose was the revealed it was didn't seem to be a big deal and the characters continued on without really needing her help anyway. Maybe I missed the entire reason for this character. For me the book only got interesting in the last quarter, the rest was a struggle, but by that time I had invested a lot of time into these characters. However, none of them were in any way enduring with the exception of a sentient farm robot, ColU, left behind to help with the colonisation. The world building was great, there did seem to be a lot of thought put into the politics and history of both planets, hints and clues to why this or that happened are peppered though out the book without follow up (sort of like real life). This is something that I did enjoy, trying to figure out a 'plot' that in the end seemed non-existent. I really wanted to know more about the local life forms and the history of the sentients they found, and it seemed to me like ColU was too. ColU was busting to tell anyone who would listen, but anytime 'he' spoke about them and things started to get interesting the humans shushed him up or ignored him and the story moved on. The book ended in a rather strange cliff hanger, but it was one which left me wanting to read the next book, Ultima, in the series. I am half way through Ultima and am enjoying it much more than the first. Interested in checking out this series? Use the links below to grab yourself a copy, and support WolfsBooks at the same time. In regards to 'stepping sideways' into alternative universes much preferred Stephen Baxters Long Earth series.